Are you working to increase lab sales leads and sell lab equipment at top research institutions in New York? If you’d like to network with researchers at Mount Sinai School of Medicine in the easiest and most economical way, you may want to consider registering early for our Mount Sinai life science marketing event up until January 27th, 2014. The Mount Sinai BioResearch Product Faire™ Event will be held on March 26th, 2014. By registering early, you will be getting the best value for your life science marketing at Mount Sinai School of Medicine. Mount Sinai School of Medicine has a wealth of research funding available to researchers for purchasing lab equipment and services. In 2012, the NIH awarded Mount Sinai $178.7 million in research funding. In addition to the funding awarded by the NIH, Mount Sinai received $510,555 in research funding from the NSF in 2012. For more funding information on Mount Sinai School of Medicine, including a departmental breakdown of NIH funding and top NSF-funded projects at the university, please read our blog Research Funding Totals $179.2M at Mount Sinai. By registering early for our Mount Sinai, you will be guaranteed a table even if the event sells out. This is a popular event, and lab suppliers in the area won’t want to miss out on this life science marketing opportunity. Last year, our Mount Sinai life science marketing event attracted 300 attendees. Of those who came, 80 were purchasing agents, professors and post docs, and 31 were lab managers. The balance was research associates and postgraduate students. Not only will you be guaranteed a table at the Mount Sinai BioResearch Product Faire™ Event when you register early, but you will receive early registration pricing. Registering early is the best way to get the most value for your dollar when exhibiting with Biotechnology Calendar, Inc. Researchers and exhibitors alike love our life science marketing events. Researchers enjoy the food, prizes and social atmosphere, while exhibitors value the opportunity to increase lab sales leads and sell lab equipment. For more reasons why attendees and exhibitors value Biotechnology Calendar, Inc.’s Mount Sinai life science marketing event, please read our blog Meet Researchers at Mount Sinai School of Medicine. 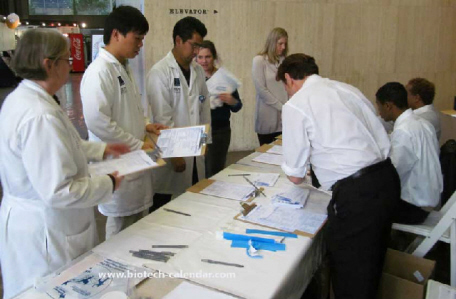 Biotechnology Calendar, Inc. invites lab suppliers to increase lab sales leads and sell lab equipment at our Mount Sinai BioResearch Product Faire™ Event on March 26th, 2014. Remember to register early by January 27th, 2014 for a guaranteed spot at the event, early registration pricing and the best value life science marketing opportunity. We look forward to seeing you there! Biotechnology Calendar, Inc. is a full-service life science events-planning and marketing company that has been producing trade shows at top research institutions for over 20 years. If you are interested in increasing lab sales leads and selling lab equipment at life science marketing events closer to home, we encourage you to view our 2014 calendar of events. For more information on our Mount Sinai BioResearch Product Faire™ Event, or to view more funding statistics for Mount Sinai School of Medicine, click on the button below.